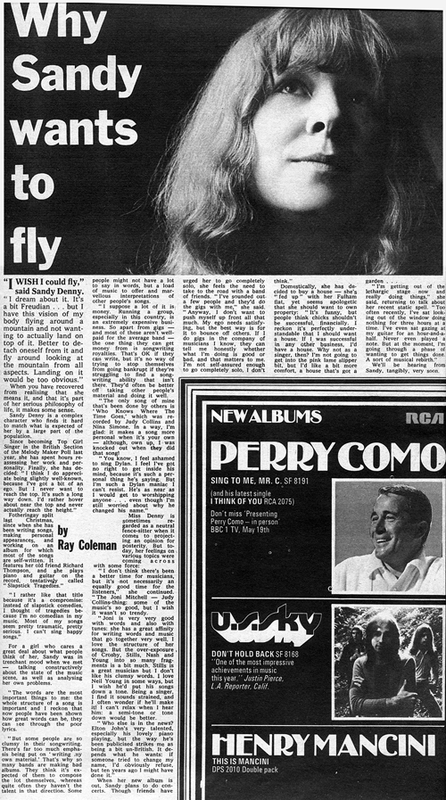 “I wish I could fly,” said Sandy Denny. “I dream about it. It’s a bit Freudian…but I have this vision of my body flying around a mountain and not wanting to actually land on top of it. Better to detach oneself from it and fly around looking at the mountain from all aspects. Landing on it would be too obvious.” When you have recovered from realising that she means it, and that it’s part of her serious philosophy of life, it makes some sense. Sandy Denny is a complex character who finds it hard to match what is expected of her by a large part of the population. Fotheringay split last Christmas, since when she has been writing songs, making personal appearances, and working on an album for which most of the songs are self-written. It features her old friend Richard Thompson, and she plays piano and guitar on the record, tentatively called Slapstick Tragedies (eventually titled ‘The North Star Grassman and the Ravens’). For a girl who cares a great deal about what people think of her, Sandy was in trenchant mood when we met–talking constructively about the state of the music scene as well as analysing her own problems. “The words are the most important things to me: the whole structure of a song is important and I reckon that now people have been shown how great words can be, they can see through the poor lyrics. “But some people are so clumsy in their songwriting. There’s far too much emphasis put on `writing my own material.’ That’s why so many bands are making bad albums. They think it’s expected of them to compose the lot themselves, whereas quite often they haven’t the talent in that direction. Some people might not have a lot to say in words, but a load of music to offer and marvellous interpretations of other people’s songs. “I suppose a lot of it is money. Running a group, especially in this country, is an extremely expensive business. So apart from gigs (and most of these aren’t well-paid for the average band) the one thing they can get money from is songwriting royalties. That’s OK if they can write, but it’s no way of trying to stop themselves from going bankrupt if they’re struggling to find a songwriting ability that isn’t there. They’d often be better off taking other people’s material and doing it well. “The only song of mine that’s been done by others is ‘Who Knows Where the Time Goes’, which was recorded by Judy Collins and Nina Simone. In a way, I’m glad: it makes a song more personal when it’s your own: although, I own up, I was knocked out when they did that song! Miss Denny is sometimes regarded as a neutral fence-sitter when it comes to projecting an opinion for posterity. But today, her feelings on various topics were coming across with some force: “I don’t think there’s been a better time for musicians, but it’s not necessarily an equally good time for the listeners,” she continued. “The Joni Mitchell/Judy Collins thing: some of the music’s so good, but I wish it wasn’t so trendy. “Joni is very, very good with words and also with tunes: she has a great affinity for writing words and music that go together very well. I love the structure of her songs. But the over-exposure of Crosby, Stills, Nash and Young into so many fragments is a bit much. Stills is a great musician but I don’t like his clumsy words. I love Neil Young in some ways, but I wish he’d put his songs down a tone. Being a singer, I find it sounds strained, and I often wonder if he’ll make it! I can’t relax when I hear him: a semi-tone or tone down would be better. We’ll be hearing from Sandy, tangibly, very soon.